Smokers who have become desensitised to the horror photos on cigarette packets may be surprised to find the same images exquisitely rendered in paintings at the Museum of Contemporary Art. In a survey of Louise Hearman’s work, a glass case in a side room offers an insight into the strange, unsettling pictures found in the main galleries. A photo of stained, ugly teeth, labelled “Male smoker aged 50”, reappears as a feature in the landscape. 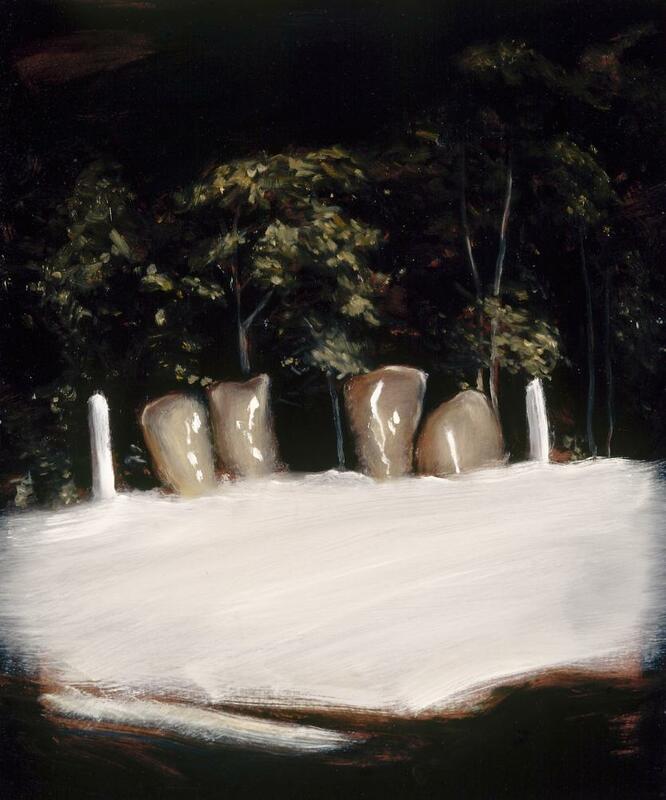 In Untitled #724 (1998) the teeth stand like fenceposts by the side of a road, illuminated by headlights. Four teeth appear in extreme close-up in Untitled #1339 (2011). The one on the right carries the image of a small child in a white robe, standing with her back to the viewer. The ugliest, most fearsome set of choppers is found in Untitled #475 (1996), lurking in the twilight in front of the dark silhouettes of trees. These teeth are not just stained, a couple are jet black and glistening. Hearman (b.1963) is not solely preoccupied with teeth, the display case also contains joke eyeballs, an assortment of glass trinkets and strings, and an unruly mop of dark hair. Scattered among these items are small drawings of the artist’s dog – a favourite subject. Some might accuse Hearman of a wilfully macabre approach to subject matter, but that’s not the way she sees it. On those very rare occasions when she has chosen to speak about her work, Hearman talks about the quality of light she seeks to capture, and how she gathers images intuitively while out walking or running. The unusual combinations of motifs and distortions of scale represent barely conscious decisions. All true artists know those moments in the studio when the work develops a life of its own and time seems to stand still, but in Hearman’s case the line between conscious and subconscious is almost non-existent. If Hearman is unwilling to explain her paintings it’s because they are often no less surprising and mysterious for her than they are for the viewer. She may know the origins of a scavenged image, but can’t say why it ended up in such a bizarre place. 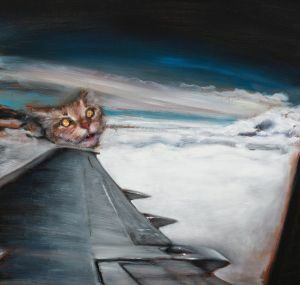 This applies to paintings such as Untitled #980 (2002), which features a horse’s head emerging from a pile of earth by the side of a road; or Untitled #1280 (2009), in which we look out the window of a plane only to see the face of a cat at the end of the wing. Call it grotesque, gothic or surreal, but Hearman’s work tends to polarise viewers. There are those who adore these dark puzzles and others who find them nightmarish. Everyone can agree on her remarkable technical finesse, which is almost unparalleled among artists of her generation. Coming through art school at a time when the importance of drawing was being denied, she emerged as a skilful, prolific draughtswoman. As a painter in oils, she has the rare ability to create a realistic-looking image with a few strokes. It’s a talent we only appreciate as we get up close to a picture and see the quick, expressive nature of her brushwork. Less than two years ago Hearman was struggling to sell pictures, and feeling disenchanted with the art world. She had reached a mid-career moment when most of the collectors who admired her work seemed to be satisfied with what they already owned. While she continued to paint on a relatively small scale it was hard to sell these works for the prices that an artist of her stature should command. Everything began to change when she won the $150,000 Doug Moran National Portrait Prize in 2014, with dual pictures of her long-term partner, photographer, Bill Henson. This year she added the Archibald Prize to her swag, with a portrait of Barry Humphries that catches the comedian in an unguarded moment. On first impressions I didn’t like the work at all, but now I’m gradually coming around. The stumbling block is that we have become so accustomed to Humphries playing a role that it’s difficult to accept him without the mask. The MCA survey puts the cap on a brilliant year-and-a-half, which has put Hearman back into the spotlight and unleashed a previously unsuspected knack for public speaking. For someone who was doggedly inarticulate, she has discovered a new eloquence on every subject but herself. There’s never been any doubt about Hearman’s intelligence, but it is only in middle-age that she seems to have abandoned Matisse’s dictum that if you want to be a painter, first you must cut out your tongue. Curator Anna Davis has made an astute selection of about 90 works, and hung the show in a way that creates loose associations between images separated by a decade or more. It reveals a career that doesn’t follow a linear progression, and resists division into periods. It also confirms that the MCA’s renovated spaces are better suited to displays of easel-sized painting than outlandish installations. This may be the museum’s best looking show since the Ken Whisson retrospective of 2012. To declare an interest I’ve written a catalogue essay, but that’s the limit of my involvement. I’m familiar with many of these paintings but they never relinquish their ambiguities. One gropes around in the dark, looking for associations with the cinema or music. For instance, Untitled #1118 (2005), is a shot of a road disappearing into sheer blackness. 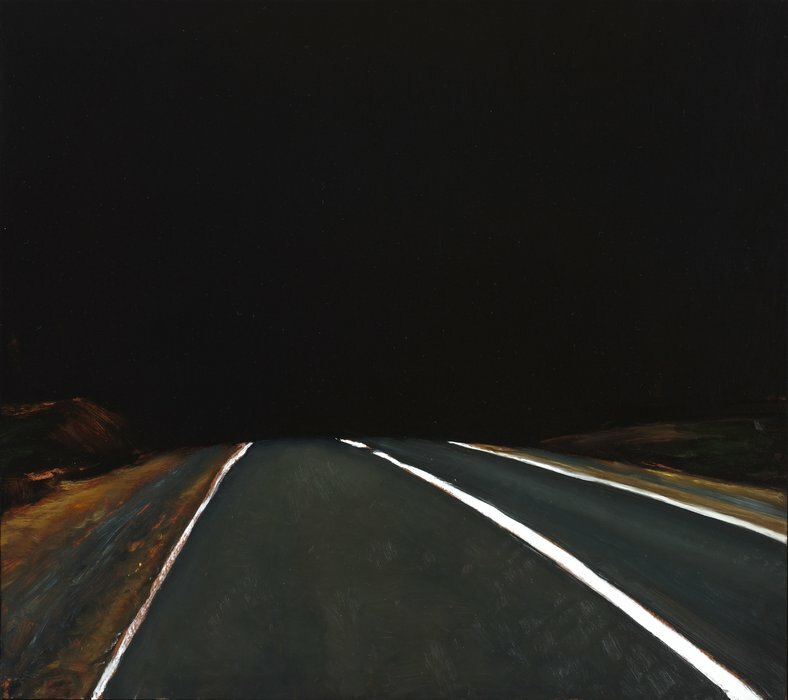 I thought of the same scene in David Lynch’s Lost Highway (1997), a film every bit as cryptic as one of Hearman’s paintings. I don’t think the Hank Williams song of the same name is quite so relevant. Lynch is a filmmaker who has been swallowed by his own ambiguities. What seemed mesmeric in Lost Highway or Mulholland Drive (2001), became utterly incomprehensible by the time of Inland Empire (2006). Hearman, by contrast, has continued to return to the same motifs, and work on the same small scale. The only serious departures are two abstract digital prints of blurred concentric circles. This continues her fascination with light but loses the benefits of her unusual imagery. I expect it’s only an experiment. Many of Hearman’s paintings and drawings are beautiful in a straightforward manner. She shows us the luminous face of a child, and makes dogs and cats seem almost human in the alertness of their expressions. But for every attractive face there is a scene that defies common sense. 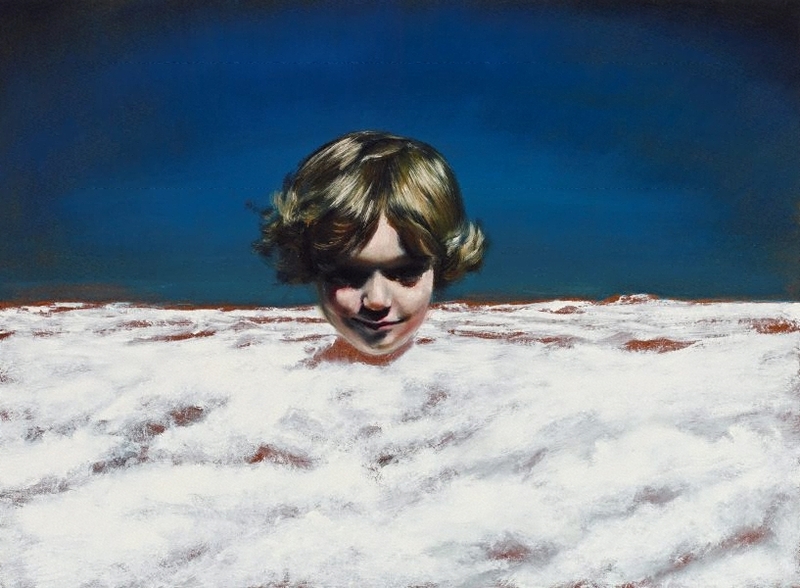 In Untitled #1279 (2002), a child’s head pops up through the clouds; in Untitled #816 (2000) a girl in a white blouse is invisible from the waist-down. Hearman paints the heads of people and animals with immaculate skill, but often neglects to provide a body. These decapitated heads float in space, outlined against the darkness like ghosts in a Japanese horror movie. One might see them as symbols of the thinking mind or the soul, freed from the constraints of the body. They remind us that we are not looking at a window onto the world, but a parallel reality generated by the artist’s imagination. Having mastered the art of depicting objects in a realistic manner, Hearman wants us to see painting as a medium that allows for an unlimited range of invention. We don’t need a set of 3D glasses and a hundred million dollars’ worth of CGI to momentarily escape our sense of space and time. We can have the same experience standing in front of an oil painting in which the laws of physics have been suspended. With most paintings we enjoy the feeling of having our perceptions of beauty reaffirmed. One looks upon a landscape as if it were a real piece of nature transferred onto canvas. A painted bowl of fruit preserves forever the freshness that real fruit soon loses. A portrait charms us with its likeness to the subject and its psychological acuity. With Hearman’s work we have a different experience, being drawn to a velvety nocturnal landscape, only to find a disembodied head floating in the gloom. It recalls Hamlet’s warning that there are more things in heaven and earth than we have dreamt of in our science and philosophy.